Neurotic gardeners can develop a love-hate relationship with their messy fruit trees. Trees with smaller fruits and ornamental specimens are especially problematic as they drop copious amounts of debris and aborted fruit. The constant clutter is an eyesore on the otherwise manicured landscape, attracting rodents and birds and posing a slipping hazard as the fruits rot. Knowing how to sterilize a fruit tree can minimize the untidiness, yet preserve the beauty of the plant. What is fruit tree sterilization? Sterilization is simply a method to keep trees from fruiting. 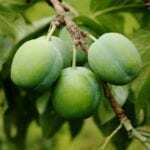 What is Fruit Tree Sterilization? When you sterilize fruit trees, you interrupt their production of auxin. Auxin is a plant hormone that controls plant growth. Growth inhibitors block transportation of auxin so it doesn’t circulate through the plant and complete its purpose. Once auxin is blocked, the tree cells do not receive the signals they need to reproduce and change their cell responses. The idea is to keep trees from fruiting and avoid those messy piles of debris under the tree. It is also useful in orchards to allow trees a fallow period to recover from disease or control when plants bloom for weather reasons. Can You Sterilize a Tree? Plant inhibitors have been used for decades by farmers, orchard owners and large scale land management corporations. It is a common practice among commercial growers to keep plants a desired shape and size while also controlling fruiting. The process is also called sterilization. Can you sterilize a fruit tree in the home landscape? It is possible, but some plants can sustain long-term damage and fail to fruit for several seasons. The hormone controls are available to gardeners but require training and exact timing to complete the procedure. It is not an exact science even to professional arborists and results may be mixed. It is preferred to choose appropriate trees for your landscape or even remove a nuisance tree as the chemicals used can also be harmful to beneficial insects like bees. Home application of hormone regulators can be difficult. The first consideration is timing. You must spray when the flowers have just formed but before fruits begin to take shape. There is no way to get every bloom since the exposure to light and elements influences each area of production on the tree, but you can get the majority. Apply when there is no wind and temperatures are between 60 and 90 degrees Fahrenheit. Follow the application rate recommended by the manufacturer. Choose the correct formula for your tree variety. Some of the chemicals available go under the name Florel, Fruitone, App-L-Set and Carbaryl. Be wary of their effects to unhealthy trees and to honeybee populations.